Designed for comfort and durability, this heavy duty big and tall rolling office chair is tailor made for people of any size or height! The extra thick, foam seat is made with comfort in mind, and the heavy-duty construction is safe and stable. Many police stations choose this model due to the seat width so that the officer's gun belts do not catch on the arms. Features on this tall desk chair include a 400 lb. 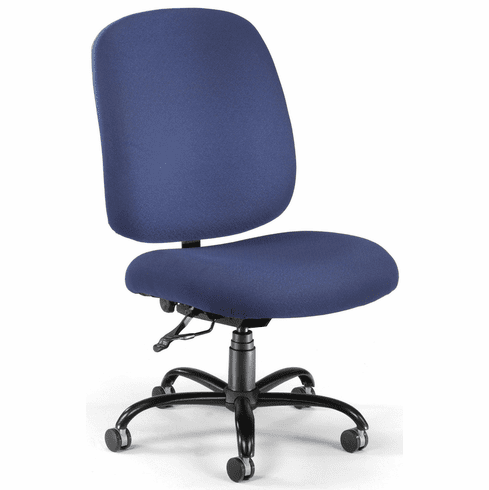 weight capacity, hi-density 5 1/2" thick seat foam, 3/4" plywood seat frame, fully upholstered back, optional heavy duty height adjustable arms, pneumatic seat height adjustment, back angle adjustment, back height adjustment, heavy duty 5 star base and casters. The fabric is Teflon-coated to be stain-resistant. Meets or exceeds ANSI/BIFMA safety standards. Manufacturers limited lifetime warranty from OFM. Dimensions: Seat Size: 23"W x 22.5"D. Back Size: 24"W x 23"H. Seat height adjustment: 18"-22"H. Limited lifetime warranty from OFM. These big and tall office chairs normally ship in 1-2 business days from our NC warehouse.